Our first visit to Tropicana City saw us driving around aimlessly inside the huge parking lot; figuring an exit out of the building. There were several Self Luminous Exit Signs to guide us but since it was our first visit there, it was nonetheless a little confusing. Plus, we weren't familiar with the all the corners and turns of this shopping mall and the lack of clear Exit Signs within the parking lot made us momentarily lost. It was bad enough that both B and I forgot which floor we parked the car. So we followed the Photoluminescent Exit Signs hoping they would lead us to our parking floor but the first two times were disastrous. We walked out all the way to the parking lot but couldn't find our car so we went back inside the mall and decided to retrace our steps and finally, we located our car! Tonight, we plan to visit Tropicana City again and I hope we won't have a hard time exiting the mall this time. Before we got into the whole lost-in-the-parking-lot incident, we had dinner at a cosy little Japanese restaurant called Kushi. The food was terrific and prices even better and we loved it so much that we plan to have dinner there later. Anyone else in the mood for Japanese food? Yepee...I was able to make it! I have similar experience when I visited a mall in Manila for the first time. You did it Ruby woo hoo! Oh yeah? I had a similar experience with a hotel once too Ruby, driving around and around trapped inside lol! Yeap.. that looks delish GP. what is that? I'm a disaster when remembering parking lots lott..lol! Same here dearie…always forget where we park or where we came from, I blame it on my bad sense of direction hehehehe…. Ooh.. yelah.. even the pics look so delish! Hahah.. me too!!! Lucky A can always remember.. lol! Not to mensi cheap LJ..I think this is B’s fave Jap place now ha ha! Got lost in the shopping mall? Haha! I always get lost when I go Sunway Pyramid! Don't know why I still find the place confusing till this day. Maybe because I seldom go there! The place I won't ever get lost is 1Utama! I know place like the back of my hand! Wow! japanese food! I love Japanese food, but never been to this restaurant! Yelah.. next time take picture.. hahah.. sometimes if I remember I do that..
was Kushi on the LG in Tropicana City Mall behind Carrefour? I think i ate opposite of it at the "Eat'n Run". I would say to this restaurant ... just run, don't eat. Recent blog:=- Save Money, Energy and green your Computer! Haha I tak pernah take picture, tak terfikir pun LOL! Good morning to you Marzie :) hmmm... I think it's already noon there ? The foods look nice! :) But it doesn't look very japanese. Yup, Tropicana City Mall has a drama exit, I can't stand the winding uphill exit just to get back out to TTDI. 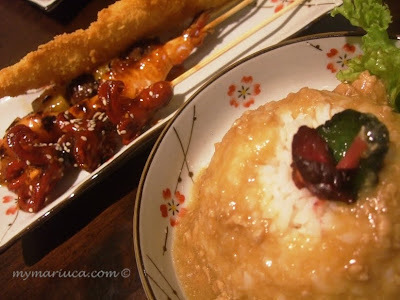 I haven't been to Kushi yet..
but I'd love to try it out! coz i love Jap food!! oh what's that Mariuca?? This is beef n seafood set Mon, so got my fave Japanese squid yum! This one on ground floor I think Mon…. Is it???? COMB? Ohhhh not so cute then hahahhahahah! Kushi sounds like something fluffy he he……. Yeah kushi kushi koo…. Wah so fast, good job! I dropped 600 now dropping last 300 for WOAFS, u can zzz edi sweetie!